Pregnancy can change many things about a woman’s body, including her teeth. Sara Mitra, a jazz singer and songwriter, discovered this first-hand after giving birth to her daughter Eleanor. Discover how pregnancy changed Sara’s mouth and how Invisalign helped her regain her voice. Sara Mitra had a successful first album, a highlight of her career as a jazz singer and songwriter. Then she became pregnant and had a baby girl she named Eleanor. In 2011, she began work on another album. However, it quickly became obvious that Sara’s voice had changed. The way she pronounced words was different. Sometimes, her diction and her voice sounded fuzzy and unclear. Concerned about her career, Sara visited a dentist, who informed her that pregnancy can cause a woman’s gums to swell. The swelling sometimes moves the teeth into slightly new positions. Troubled by the obvious changes in her teeth and her singing, Sarah decided to look for a solution. She knew that traditional braces could affect her singing even further, as well as detracting from her image during performances. Although a lingual brace worn behind the teeth might have fixed the image issue, her pronunciation and singing voice would be changed even further, and her tongue— an important organ for singers— might be too restricted. Thankfully, experts at the London Smile Clinic informed Sara about the Invisalign option. Over a period of 18 months or so, the clear aligners would straighten her teeth. They are completely removable, so she could take them out to record or perform. Other than those circumstances, Sara was told to keep the aligners in for 22 hours a day, removing them only at mealtime. Even though the aligners required a time commitment and a refitting for new trays every few weeks, Sara was very pleased with the results. “I love my teeth now!” she says. Unfortunately, her protruding canine tooth did not respond to Invisalign treatment, so she eventually resorted to a fixed metal brace to solve that issue. 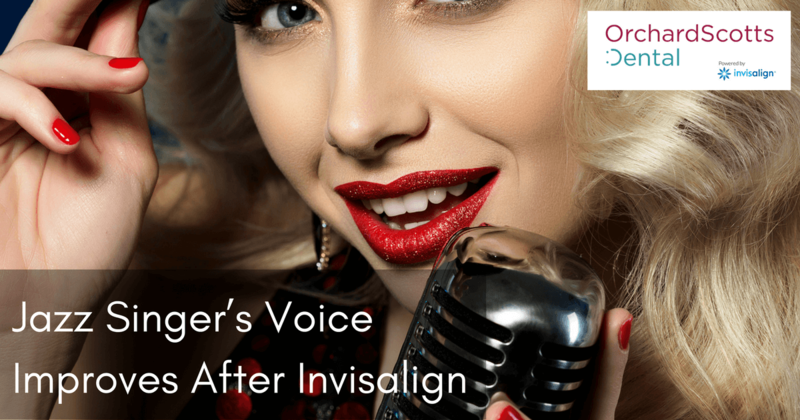 However, thanks to Invisalign, the problem was resolved enough to allow her to continue recording and performing until her second pregnancy. Today, she continues to wear retainers to ensure that her teeth do not move again. Perhaps you, like Sara Mitra, have discovered that pregnancy or some other life circumstance has affected your teeth. Contact Orchard Scotts Dental, a recognised Singapore Invisalign provider, to find out more about how Invisalign may be able to help you. In addition to Invisalign, our Singapore dental clinic offers other cosmetic services, such as laser gum reshaping, implants, veneers, and whitening. Call now to arrange your first appointment.